"Vlad Țepeș" redirects here. For other uses, see Vlad Țepeș (disambiguation). This article is about Vlad Dracula, a medieval ruler of Wallachia. For the fictional vampire, see Count Dracula. Vlad III, known as Vlad the Impaler (Romanian: Vlad Țepeș, Bulgarian: Влад Цепеш, pronunciation: [ˈvlad ˈt͡sepeʃ] ) or Vlad Dracula (/ˈdrækjələ/ (Romanian: Vlad Drăculea, pronunciation: [ˈdrəkule̯a] , Bulgarian: Влад Дракула); 1428/31 – 1476/77), was voivode (or prince) of Wallachia three times between 1448 and his death. He is often considered one of the most important rulers Wallachia had and a national hero of Romania. The expression Dracula, which is now primarily known as the name of a fictional vampire, was for centuries known as the sobriquet of Vlad III. Diplomatic reports and popular stories referred to him as Dracula, Dracuglia, or Drakula already in the 15th century. He himself signed his two letters as "Dragulya" or "Drakulya" in the late 1470s. His name had its origin in the sobriquet of his father, Vlad Dracul ("Vlad the Dragon" in medieval Romanian), who received it after he became a member of the Order of the Dragon. Dracula is the Slavonic genitive form of Dracul, meaning "[the son] of Dracul (or the Dragon)". In modern Romanian, dracul means "the devil", which contributed to Vlad's reputation. 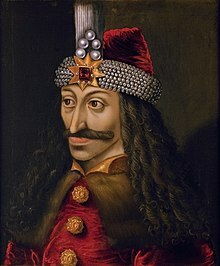 Vlad III is known as Vlad Țepeș (or Vlad the Impaler) in Romanian historiography. This sobriquet is connected to the impalement that was his favorite method of execution. The Ottoman writer Tursun Beg referred to him as Kazıklı Voyvoda (Impaler Lord) around 1500. Mircea the Shepherd, Voivode of Wallachia, used this sobriquet when referring to Vlad III in a letter of grant on 1 April 1551. Vlad was the second legitimate son of Vlad II Dracul, who was an illegitimate son of Mircea I of Wallachia. Vlad II had won the moniker "Dracul" for his membership in the Order of the Dragon, a militant fraternity founded by Holy Roman Emperor Sigismund. The Order of the Dragon was dedicated to halting the Ottoman advance into Europe. As he was old enough to be a candidate to the throne of Wallachia in 1448, his time of birth would have been between 1428 and 1431. Vlad was most probably born after his father settled in Transylvania in 1429. Historian Radu Florescu writes that Vlad was born in the Transylvanian Saxon town of Sighișoara (then in the Kingdom of Hungary), where his father lived in a three-storey stone house from 1431 to 1435. Modern historians identify Vlad's mother either as a daughter or a kinswoman of Alexander I of Moldavia, or as his father's unknown first wife. Vlad II Dracul seized Wallachia after the death of his half-brother Alexander I Aldea in 1436. One of his charters (which was issued on 20 January 1437) preserved the first reference to Vlad III and his elder brother, Mircea, mentioning them as their father's "first born sons". They were mentioned in four further documents between 1437 and 1439. The last of the four charters also referred to their younger brother, Radu. After a meeting with John Hunyadi, Voivode of Transylvania, Vlad II Dracul did not support an Ottoman invasion of Transylvania in March 1442. The Ottoman Sultan, Murad II, ordered him to come to Gallipoli to demonstrate his loyalty. Vlad and Radu accompanied their father to the Ottoman Empire, where they were all imprisoned. Vlad Dracul was released before the end of the year, but Vlad and Radu remained hostages to secure his loyalty. They were held imprisoned in the fortress of Eğrigöz (now Doğrugöz), according to contemporaneous Ottoman chronicles. Their lives were especially in danger after their father supported Vladislaus, King of Poland and Hungary, against the Ottoman Empire during the Crusade of Varna in 1444. Vlad II Dracul was convinced that his two sons were "butchered for the sake of Christian peace", but neither Vlad nor Radu was murdered or mutilated after their father's rebellion. Vlad Dracul again acknowledged the sultan's suzerainty and promised to pay a yearly tribute to him in 1446 or 1447. John Hunyadi (who had become the regent-governor of Hungary in 1446) broke into Wallachia in November 1447. The Byzantine historian Michael Critobulus wrote that Vlad and Radu fled to the Ottoman Empire, which suggests that the sultan had allowed them to return to Wallachia after their father paid homage to him. Vlad Dracul and his eldest son, Mircea, were murdered. 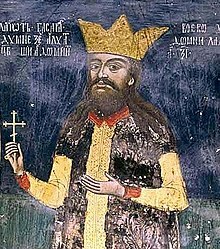 Hunyadi made Vladislav II (son of Vlad Dracul's cousin, Dan II) the ruler of Wallachia. Upon the death of his father and elder brother, Vlad became a potential claimant to Wallachia. Vladislav II of Wallachia accompanied John Hunyadi, who launched a campaign against the Ottoman Empire in September 1448. Taking advantage of his opponent's absence, Vlad broke into Wallachia at the head of an Ottoman army in early October. He had to accept that the Ottomans had captured the fortress of Giurgiu on the Danube and strengthened it. The Ottomans defeated Hunyadi's army in the Battle of Kosovo between 17 and 18 October. Hunyadi's deputy, Nicholas Vízaknai, urged Vlad to come to meet him in Transylvania, but Vlad refused him. Vladislav II returned to Wallachia at the head of the remnants of his army. Vlad was forced to flee to the Ottoman Empire before 7 December 1448. Vlad first settled in Edirne in the Ottoman Empire after his fall. Not long after, he moved to Moldavia, where Bogdan II (his father's brother-in-law and possibly his maternal uncle) had mounted the throne with John Hunyadi's support in the autumn of 1449. After Bogdan was murdered by Peter III Aaron in October 1451, Bogdan's son, Stephen, fled to Transylvania with Vlad to seek assistance from Hunyadi. However, Hunyadi concluded a three-year truce with the Ottoman Empire on 20 November 1451, acknowledging the Wallachian boyars' right to elect the successor of Vladislav II if he died. Vlad allegedly wanted to settle in Brașov (which was a center of the Wallachian boyars expelled by Vladislaus II), but Hunyadi forbade the burghers to give shelter to him on 6 February 1452. Vlad returned to Moldavia where Alexăndrel had dethroned Peter Aaron. The events of his life during the years that followed are unknown. He must have returned to Hungary before 3 July 1456, because on that day Hunyadi informed the townspeople of Brașov that he had tasked Vlad with the defence of the Transylvanian border. The circumstances and the date of Vlad's return to Wallachia are uncertain. He invaded Wallachia with Hungarian support either in April, July, or in August 1456. Vladislav II died during the invasion. Vlad sent his first extant letter as voivode of Wallachia to the burghers of Brașov on 10 September. He promised to protect them in case of an Ottoman invasion of Transylvania, but he also sought their assistance if the Ottomans occupied Wallachia. In the same letter, he stated that "when a man or a prince is strong and powerful he can make peace as he wants to; but when he is weak, a stronger one will come and do what he wants to him", showing his authoritarian personality. Multiple sources (including Laonikos Chalkokondyles's chronicle) recorded that hundreds or thousands of people were executed at Vlad's order at the beginning of his reign. He began a purge against the boyars who had participated in the murder of his father and elder brother, or whom he suspected of plotting against him. Chalkokondyles stated that Vlad "quickly effected a great change and utterly revolutionized the affairs of Wallachia" through granting the "money, property, and other goods" of his victims to his retainers. The lists of the members of the princely council during Vlad's reign also show that only two of them (Voico Dobrița and Iova) were able to retain their positions between 1457 and 1461. Vlad sent the customary tribute to the sultan. After John Hunyadi died on 11 August 1456, his elder son, Ladislaus Hunyadi became the captain-general of Hungary. He accused Vlad of having "no intention of remaining faithful" to the king of Hungary in a letter to the burghers of Brașov, also ordering them to support Vladislaus II's brother, Dan III, against Vlad. The burghers of Sibiu supported another pretender, "a priest of the Romanians who calls himself a Prince's son". The latter (identified as Vlad's illegitimate brother, Vlad the Monk) took possession of Amlaș, which had customarily been held by the rulers of Wallachia in Transylvania. Ladislaus V of Hungary had Ladislaus Hunyadi executed on 16 March 1457. Hunyadi's mother, Erzsébet Szilágyi, and her brother, Michael Szilágyi, stirred up a rebellion against the king. Taking advantage of the civil war in Hungary, Vlad assisted Stephen, son of Bogdan II of Moldavia, in his move to seize Moldavia in June 1457. Vlad also broke into Transylvania and plundered the villages around Brașov and Sibiu. The earliest German stories about Vlad recounted that he had carried "men, women, children" from a Saxon village to Wallachia and had them impaled. Since the Transylvanian Saxons remained loyal to the king, Vlad's attack against them strengthened the position of the Szilágyis. Vlad's representatives participated in the peace negotiations between Michael Szilágyi and the Saxons. According to their treaty, the burghers of Brașov agreed that they would expel Dan from their town. Vlad promised that the merchants of Sibiu could freely "buy and sell" goods in Wallachia in exchange for the "same treatment" of the Wallachian merchants in Transylvania. Vlad referred to Michael Szilágyi as "his Lord and elder brother" in a letter on 1 December 1457. Ladislaus Hunyadi's younger brother, Matthias Corvinus, was elected king of Hungary on 24 January 1458. He ordered the burghers of Sibiu to keep the peace with Vlad on 3 March. Vlad styled himself "Lord and ruler over all of Wallachia, and the duchies of Amlaș and Făgăraș" on 20 September 1459, showing that he had taken possession of both of these traditional Transylvanian fiefs of the rulers of Wallachia. Michael Szilágyi allowed the boyar Michael (an official of Vladislav II of Wallachia) and other Wallachian boyars to settle in Transylvania in late March 1458. Before long, Vlad had the boyar Michael killed. In May, Vlad asked the burghers of Brașov to send craftsmen to Wallachia, but his relationship with the Saxons deteriorated before the end of the year. According to a scholarly theory, the conflict emerged after Vlad forbade the Saxons to enter Wallachia, forcing them to sell their goods to Wallachian merchants at compulsory border fairs. Vlad's protectionist tendencies or border fairs are not documented. Instead, in 1476 Vlad emphasized that he had always promoted free trade during his reign. The Saxons confiscated the steel that a Wallachian merchant had bought in Brașov without repaying the price to him. In response, Vlad "ransacked and tortured" some Saxon merchants, according to a letter that Basarab Laiotă (a son of Dan II of Wallachia) wrote on 21 January 1459. Basarab had settled in Sighișoara and laid claim to Wallachia. However, Matthias Corvinus supported Dan III (who was again in Brașov) against Vlad. Dan III stated that Vlad had Saxon merchants and their children impaled or burnt alive in Wallachia. You know that King Matthias has sent me and when I came to Țara Bârsei the officials and councilors of Brașov and the old men of Țara Bârsei cried to us with broken hearts about the things which Dracula, our enemy, did; how he did not remain faithful to our Lord, the king, and had sided with the [Ottomans]. ... [H]e captured all the merchants of Brașov and Țara Bârsei who had gone in peace to Wallachia and took all their wealth; but he was not satisfied only with the wealth of these people, but he imprisoned them and impaled them, 41 in all. Nor were these people enough; he became even more evil and gathered 300 boys from Brașov and Țara Bârsei that he found in ... Wallachia. Of these he impaled some and burned others. Dan III broke into Wallachia, but Vlad defeated and executed him before 22 April 1460. Vlad invaded southern Transylvania and destroyed the suburbs of Brașov, ordering the impalement of all men and women who had been captured. During the ensuing negotiations, Vlad demanded the expulsion or punishment of all Wallachian refugees from Brașov. Peace had been restored before 26 July 1460, when Vlad addressed the burghers of Brașov as his "brothers and friends". Vlad invaded the region around Amlaș and Făgăraș on 24 August to punish the local inhabitants who had supported Dan III. Konstantin Mihailović (who served as a janissary in the sultan's army) recorded that Vlad refused to pay homage to the sultan in an unspecified year. The Renaissance historian Giovanni Maria degli Angiolelli likewise wrote that Vlad had failed to pay tribute to the sultan for three years. Both records suggest that Vlad ignored the suzerainty of the Ottoman Sultan, Mehmed II, already in 1459, but both works were written decades after the events. 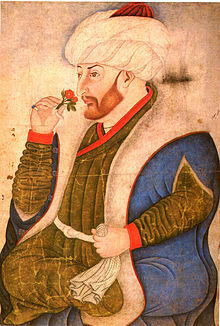 Tursun Beg (a secretary in the sultan's court) stated that Vlad only turned against the Ottoman Empire when the sultan "was away on the long expedition in Trebizon" in 1461. According to Tursun Beg, Vlad started new negotiations with Matthias Corvinus, but the sultan was soon informed by his spies. Mehmed sent his envoy, the Greek Thomas Katabolinos (also known as Yunus bey), to Wallachia, ordering Vlad to come to Constantinople. He also sent secret instructions to Hamza, bey of Nicopolis, to capture Vlad after he crossed the Danube. Vlad found out the sultan's "deceit and trickery", captured Hamza and Katabolinos, and had them executed. After the execution of the Ottoman officials, Vlad gave orders in fluent Turkish to the commander of the fortress of Giurgiu to open the gates, enabling the Wallachian soldiers to break in the fortress and capture it. He invaded the Ottoman Empire, devastating the villages along the Danube. He informed Matthias Corvinus about the military action in a letter on 11 February 1462. He stated that more than "23,884 Turks and Bulgarians" had been killed at his order during the campaign. He sought military assistance from Corvinus, declaring that he had broken the peace with the sultan "for the honor" of the king and the Holy Crown of Hungary and "for the preservation of Christianity and the strengthening of the Catholic faith". The relationship between Moldavia and Wallachia had become tense by 1462, according to a letter of the Genoese governor of Kaffa. Having learnt of Vlad's invasion, Mehmed II raised an army of more than 150,000 strong, that was said to be "second in size only to the one" that occupied Constantinople in 1453, according to Chalkokondyles. The size of the army suggests that the sultan wanted to occupy Wallachia, according to a number of historians (including Franz Babinger, Radu Florescu, and Nicolae Stoicescu). On the other hand, Mehmed had granted Wallachia to Vlad's brother, Radu, before the invasion of Wallachia, showing that the sultan's principal purpose was only the change of the ruler of Wallachia. The Ottoman fleet landed at Brăila (which was the only Wallachian port on the Danube) in May. The main Ottoman army crossed the Danube under the command of the sultan at Nicoplis on 4 June 1462. Outnumbered by the enemy, Vlad adopted a scorched earth policy and retreated towards Târgoviște. During the night of 16–17 June, Vlad broke into the Ottoman camp in an attempt to capture or kill the sultan. Either the imprisonment or the death of the sultan would have caused a panic among the Ottomans, which could have enabled Vlad to defeat the Ottoman army. However, the Wallachians "missed the court of the sultan himself" and attacked the tents of the viziers Mahmut Pasha and Isaac. Having failed to attack the sultan's camp, Vlad and his retainers left the Ottoman camp at dawn. Mehmed entered Târgoviște at the end of June. The town had been deserted, but the Ottomans were horrified to discover a "forest of the impaled" (thousands of stakes with the carcasses of executed people), according to Chalkokondyles. Tursun Beg recorded that the Ottomans suffered from summer heat and thirst during the campaign. The sultan decided to retreat from Wallachia and marched towards Brăila. Stephen III of Moldavia hurried to Chilia (now Kiliya in Ukraine) to seize the important fortress where a Hungarian garrison had been placed. Vlad also departed for Chilia, but left behind a troop of 6,000 strong to try to hinder the march of the sultan's army, but the Ottomans defeated the Wallachians. Stephen of Moldavia was wounded during the siege of Chilia and returned to Moldavia before Vlad came to the fortress. 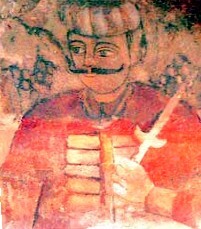 The main Ottoman army left Wallachia, but Vlad's brother Radu and his Ottoman troops stayed behind in the Bărăgan Plain. Radu sent messengers to the Wallachians, reminding them that the sultan could again invade their country. Although Vlad defeated Radu and his Ottoman allies in two battles during the following months, more and more Wallachians deserted to Radu. Vlad withdrew to the Carpathian Mountains, hoping that Matthias Corvinus would help him regain his throne. However, Albert of Istenmező, the deputy of the Count of the Székelys, had recommended in mid-August that the Saxons recognize Radu. Radu also made an offer to the burghers of Brașov to confirm their commercial privileges and pay them a compensation of 15,000 ducats. Matthias Corvinus came to Transylvania in November 1462. The negotiations between Corvinus and Vlad lasted for weeks, but Corvinus did not want to wage war against the Ottoman Empire. At the king's order, his Czech mercenary commander, John Jiskra of Brandýs, captured Vlad near Rucăr in Wallachia. To provide an explanation for Vlad's imprisonment to Pope Pius II and the Venetians (who had sent money to finance a campaign against the Ottoman Empire), Corvinus presented three letters, allegedly written by Vlad on 7 November 1462, to Mehmed II, Mahmud Pasha, and Stephen of Moldavia. According to the letters, Vlad offered to join his forces with the sultan's army against Hungary if the sultan restored him to his throne. Most historians agree that the documents were forged to give grounds for Vlad's imprisonment. Corvinus's court historian, Antonio Bonfini, admitted that the reason for Vlad's imprisonment was never clarified. Florescu writes, "[T]he style of writing, the rhetoric of meek submission (hardly compatible with what we know of Dracula's character), clumsy wording, and poor Latin" are all evidence that the letters could not be written on Vlad's order. He associates the author of the forgery with a Saxon priest of Brașov. Vlad was first imprisoned "in the city of Belgrade" (now Alba Iulia in Romania), according to Chalkokondyles. Before long, he was taken to Visegrád, where he was held for fourteen years. No documents referring to Vlad between 1462 and 1475 have been preserved. In the summer of 1475, Stephen III of Moldavia sent his envoys to Matthias Corvinus, asking him to send Vlad to Wallachia against Basarab Laiotă, who had submitted himself to the Ottomans. Stephen wanted to secure Wallachia for a ruler who had been an enemy of the Ottoman Empire, because "the Wallachians [were] like the Turks" to the Moldavians, according to his letter. According to the Slavic stories about Vlad, he was only released after he converted to Catholicism. Matthias Corvinus recognized Vlad as the lawful prince of Wallachia, but he did not provide him military assistance to regain his principality. Vlad settled in a house in Pest. When a group of soldiers broke into the house while pursuing a thief who had tried to hide there, Vlad had their commander executed because they had not asked his permission before entering his home, according to the Slavic stories about his life. Vlad moved to Transylvania in June 1475. He wanted to settle in Sibiu and sent his envoy to the town in early June to arrange a house for him. Mehmed II acknowledged Basarab Laiotă as the lawful ruler of Wallachia. Corvinus ordered the burghers of Sibiu to give 200 golden florins to Vlad from the royal revenues on 21 September, but Vlad left Transylvania for Buda in October. Vlad bought a house in Pécs that became known as Drakula háza ("Dracula's house" in Hungarian). In January 1476 John Pongrác of Dengeleg, Voivode of Transylvania, urged the people of Brașov to send to Vlad all those of his supporters who had settled in the town, because Corvinus and Basarab Laiotă had concluded a treaty. The relationship between the Transylvanian Saxons and Basarab remained tense, and the Saxons gave shelter to Basarab's opponents during the following months. Corvinus dispatched Vlad and the Serbian Vuk Grgurević to fight against the Ottomans in Bosnia in early 1476. They captured Srebrenica and other fortresses in February and March 1476. Mehmed II invaded Moldavia and defeated Stephen III in the Battle of Valea Albă on 26 July 1476. Stephen Báthory and Vlad entered Moldavia, forcing the sultan to lift the siege of the fortress at Târgu Neamț in late August, according to a letter of Matthias Corvinus. The contemporaneous Jakob Unrest added that Vuk Grgurević and a member of the noble Jakšić family also participated in the struggle against the Ottomans in Moldavia. Matthias Corvinus ordered the Transylvanian Saxons to support Báthory's planned invasion of Wallachia on 6 September 1476, also informing them that Stephen of Moldavia would also invade Wallachia. Vlad stayed in Brașov and confirmed the commercial privileges of the local burghers in Wallachia on 7 October 1476. Báthory's forces captured Târgoviște on 8 November. Stephen of Moldavia and Vlad ceremoniously confirmed their alliance, and they occupied Bucharest, forcing Basarab Laiotă to seek refuge in the Ottoman Empire on 16 November. Vlad informed the merchants of Brașov about his victory, urging them to come to Wallachia. He was crowned before 26 November. Basarab Laiotă returned to Wallachia with Ottoman support, and Vlad died fighting against them in late December 1476 or early January 1477. In a letter written on 10 January 1477, Stephen III of Moldavia related that Vlad's Moldavian retinue had also been massacred. According to Leonardo Botta, the Milanese ambassador to Buda, the Ottomans cut Vlad's corpse into pieces. Bonfini wrote that Vlad's head was sent to Mehmed II. The place of his burial is unknown. According to popular tradition (which was first recorded in the late 19th century), Vlad was buried in the Monastery of Snagov. However, the excavations carried out by Dinu V. Rosetti in 1933 found no tomb below the supposed "unmarked tombstone" of Vlad in the monastery church. Rosetti reported: "Under the tombstone attributed to Vlad there was no tomb. Only many bones and jaws of horses." Historian Constantin Rezachevici said Vlad was most probably buried in the first church of the Comana Monastery, which had been established by Vlad and was near the battlefield where he was killed. Vlad had two wives, according to modern specialists. His first wife may have been an illegitimate daughter of John Hunyadi, according to historian Alexandru Simon. Vlad's second wife was Jusztina Szilágyi, who was a cousin of Matthias Corvinus. She was the widow of Vencel Pongrác of Szentmiklós when "Ladislaus Dragwlya" married her, most probably in 1475. She survived Vlad Dracul, and first married Pál Suki, then János Erdélyi. Vlad's eldest son, Mihnea, was born in 1462. Vlad's unnamed second son was killed before 1486. Vlad's third son, Vlad Drakwlya, unsuccessfully laid claim to Wallachia around 1495. He was the forefather of the noble Drakwla family. Stories about Vlad's brutal acts began circulating during his lifetime. After his arrest, courtiers of Matthias Corvinus promoted their spread. The papal legate, Niccolo Modrussiense, had already written about such stories to Pope Pius II in 1462. Two years later, the pope included them in his Commentaries. The meistersinger Michael Beheim wrote a lengthy poem about Vlad's deeds, allegedly based on his conversation with a Catholic monk who had managed to escape from Vlad's prison. The poem, called Von ainem wutrich der heis Trakle waida von der Walachei (Story of a Bloodthirsty Madman Called Dracula of Wallachia), was performed at the court of Frederick III, Holy Roman Emperor in Wiener Neustadt during the winter of 1463. According to one of Beheim's stories, Vlad had two monks impaled to assist them to go to heaven, also ordering the impalement of their donkey because it began braying after its masters' death. Beheim also accused Vlad of duplicity, stating that Vlad had promised support to both Matthias Corvinus and Mehmed II but did not keep the promise. In 1475 Gabriele Rangoni, Bishop of Eger (and a former papal legate), understood that Vlad had been imprisoned because of his cruelty. Rangoni also recorded the rumour that while in prison Vlad caught rats to cut them up into pieces or stuck them on small pieces of wood, because he was unable to "forget his wickedness". Antonio Bonfini also recorded anecdotes about Vlad in his Historia Pannonica around 1495. Bonfini wanted to justify both the removal and the restoration of Vlad by Matthias. He described Vlad as "a man of unheard cruelty and justice". Bonfini's stories about Vlad were repeated in Sebastian Münster's Cosmography. Münster also recorded Vlad's "reputation for tyrannical justice". ... Turkish messengers came to [Vlad] to pay respects, but refused to take off their turbans, according to their ancient custom, whereupon he strengthened their custom by nailing their turbans to their heads with three spikes, so that they could not take them off. Works containing the stories about Vlad's cruelty were published in Low German in the Holy Roman Empire before 1480. The stories were allegedly written in the early 1460s, because they describe Vlad's campaign across the Danube in early 1462, but they do not refer to Mehmed II's invasion of Wallachia in June of the same year. They provide a detailed narration of the conflicts between Vlad and the Transylvanian Saxons, showing that they originated "in the literary minds of the Saxons". The stories about Vlad's plundering raids in Transylvania were clearly based on an eyewitness account, because they contain accurate details (including the lists of the churches destroyed by Vlad and the dates of the raids). They describe Vlad as a "demented psychopath, a sadist, a gruesome murderer, a masochist", worse than Caligula and Nero. However, the stories emphasizing Vlad's cruelty are to be treated with caution because his brutal acts were very probably exaggerated (or even invented) by the Saxons. The invention of movable type printing contributed to the popularity of the stories about Vlad, making them one of the first "bestsellers" in Europe. To enhance sales, they were published in books with woodcuts on their title pages that depicted horrific scenes. For instance, the editions published in Nuremberg in 1499 and in Strasbourg in 1500 depict Vlad dining at a table surrounded by dead or dying people on poles. ... [Vlad] had a big copper cauldron built and put a lid made of wood with holes in it on top. He put the people in the cauldron and put their heads in the holes and fastened them there; then he filled it with water and set a fire under it and let the people cry their eyes out until they were boiled to death. And then he invented frightening, terrible, unheard of tortures. He ordered that women be impaled together with their suckling babies on the same stake. The babies fought for their lives at their mother's breasts until they died. Then he had the women's breasts cut off and put the babies inside headfirst; thus he had them impaled together. These stories may have influenced Martin Luther's Beerwolf concept of a ruler who is worse than a tyrant and must be resisted by the people. In 1550, the leaders of the German city of Magdeburg included a Beerwolf clause as part of a complicated legal argument discussing when an evil ruler should be resisted under the doctrine of the lesser magistrate. There are more than twenty manuscripts (written between the 15th and 18th centuries) which preserved the text of the Skazanie o Drakule voievode (The Tale about Voivode Dracula). The manuscripts were written in Russian, but they copied a text that had originally been recorded in a South Slavic language, because they contain expressions alien to the Russian language but used in South Slavic idioms (such as diavol for "evil"). The original text was written in Buda between 1482 and 1486. The nineteen anecdotes in the Skazanie are longer than the German stories about Vlad. They are a mixture of fact and fiction, according to historian Raymond T. McNally. Almost half of the anecdotes emphasize, like the German stories, Vlad's brutality, but they also underline that his cruelty enabled him to strengthen the central government in Wallachia. For instance, the Skazanie writes of a golden cup that nobody dared to steal at a fountain because Vlad "hated stealing so violently ... that anybody who caused any evil or robbery ... did not live long", thereby promoting public order, and the German story about Vlad's campaign against Ottoman territory underlined his cruel acts while the Skazanie emphasized his successful diplomacy. On the other hand, the Skazanie sharply criticized Vlad for his conversion to Catholicism, attributing his death to this apostasy. Some elements of the anecdotes were later added to Russian stories about Ivan the Terrible of Russia. The mass murders that Vlad carried out indiscriminately and brutally would most likely amount to acts of genocide and war crimes by current standards. Romanian defense minister Ioan Mircea Pașcu asserted that Vlad would have been condemned for crimes against humanity had he been put on trial at Nuremberg. The Cantacuzino Chronicle was the first Romanian historical work to record a tale about Vlad the Impaler, narrating the impalement of the old boyars of Târgoviște for the murder of his brother, Dan. 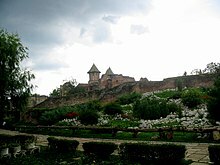 The chronicle added that Vlad forced the young boyars and their wives and children to build the Poienari Castle. The legend of the Poienari Castle was mentioned in 1747 by Neofit I, Metropolitan of Ungro–Wallachia, who complemented it with the story of Meșterul Manole, who allegedly walled in his bride to prevent the crumbling of the walls of the castle during the building project. In the early 20th century, Constantin Rădulescu-Codin, a teacher in Muscel County where the castle was situated, published a local legend about Vlad's letter of grant "written on rabbit skin" for the villagers who had helped him to escape from Poienari Castle to Transylvania during the Ottoman invasion of Wallachia. In other villages of the region, the donation is attributed to the legendary Radu Negru. Rădulescu-Codin recorded further local legends, some of which are also known from the German and Slavic stories about Vlad, suggesting that the latter stories preserved oral tradition. For instance, the tales about the burning of the lazy, the poor, and the lame at Vlad's order and the execution of the woman who had made her husband too short a shirt can also be found among the German and Slavic anecdotes. The peasants telling the tales knew that Vlad's sobriquet was connected to the frequent impalements during his reign, but they said only such cruel acts could secure public order in Wallachia. You must come, O dread Impaler, confound them to your care. Then set fire to the prison and the lunatic asylum. 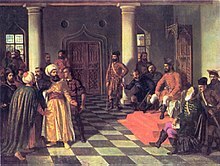 In the early 1860s, the painter Theodor Aman depicted the meeting of Vlad and the Ottoman envoys, showing the envoys' fear of the Wallachian ruler. Since the middle of the 19th century, Romanian historians have treated Vlad as one of the greatest Romanian rulers, emphasizing his fight for the independence of the Romanian lands. Even Vlad's acts of cruelty were often represented as rational acts serving national interest. Alexandru Dimitrie Xenopol was one of the first historians to emphasize that Vlad could only stop the internal fights of the boyar parties through his acts of terror. Constantin C. Giurescu remarked, "The tortures and executions which [Vlad] ordered were not out of caprice, but always had a reason, and very often a reason of state." Ioan Bogdan was one of the few Romanian historians who did not accept this heroic image. In his work published in 1896, Vlad Țepeș and the German and Russian Narratives, he concluded that the Romanians should be ashamed of Vlad, instead of presenting him as "a model of courage and patriotism". According to an opinion poll conducted in 1999, 4.1% of the participants chose Vlad the Impaler as one of "the most important historical personalities who have influenced the destiny of the Romanians for the better". The stories about Vlad made him the best-known medieval ruler of the Romanian lands in Europe. However, Bram Stoker's Dracula, which was published in 1897, was the first book to make a connection between Dracula and vampirism. Stoker had his attention drawn to the blood-sucking vampires of Romanian folklore by Emily Gerard's article about Transylvanian superstitions (published in 1885). His limited knowledge about the medieval history of Wallachia came from William Wilkinson's book (Account of the Principalities of Wallachia and Moldavia with Political Observations Relative to Them), published in 1820. Stoker "apparently did not know much about" Vlad the Impaler, "certainly not enough for us to say that Vlad was the inspiration for" Count Dracula, according to Elizabeth Miller. For instance, Stoker wrote that Dracula had been of Székely origin only because he knew about both Attila the Hun's destructive campaigns and the alleged Hunnic origin of the Székelys. Stoker's main source, Wilkinson, who accepted the reliability of the German stories, described Vlad as a wicked man. Actually, Stoker's working papers for his book contain no references to the historical figure. Consequently, Stoker borrowed the name and "scraps of miscellaneous information" about the history of Wallachia when writing his book about Count Dracula. Pope Pius II's legate, Niccolò Modrussa, painted the only extant description of Vlad, whom he had met in Buda. A copy of Vlad's portrait has been featured in the "monster portrait gallery" in the Ambras Castle at Innsbruck. The picture depicts "a strong, cruel, and somehow tortured man" with "large, deep-set, dark green, and penetrating eyes", according to Florescu. The color of Vlad's hair cannot be determined, because Modrussa mentions that Vlad was black-haired, while the portrait seems to show that he had fair hair. The picture depicts Vlad with a large lower lip. Vlad's bad reputation in the German-speaking territories can be detected in a number of Renaissance paintings. He was portrayed among the witnesses of Saint Andrew's martyrdom in a 15th-century painting, displayed in the Belvedere in Vienna. A figure similar to Vlad is one of the witnesses of Christ in the Calvary in a chapel of the St. Stephen's Cathedral in Vienna. [Vlad] was not very tall, but very stocky and strong, with a cold and terrible appearance, a strong and aquiline nose, swollen nostrils, a thin and reddish face in which the very long eyelashes framed large wide-open green eyes; the bushy black eyebrows made them appear threatening. His face and chin were shaven, but for a moustache. The swollen temples increased the bulk of his head. A bull's neck connected [with] his head from which black curly locks hung on his wide-shouldered person. ^ Cazacu 2017, pp. 81-83. ^ a b Nandriș 1991, p. 228. ^ Treptow 2000, p. 16. ^ Nandriș 1991, p. 229. ^ Treptow 2000, p. 8. ^ a b Nandriș 1991, p. 231. ^ a b c d e Treptow 2000, p. 10. ^ Treptow 2000, p. 189. ^ Livingstone, David (2011). Terrorism and the Illuminati: A Three-thousand-year History. Jerome, Idaho: Progressive Press. p. 105. ISBN 9781615773060. Retrieved 21 November 2017. ^ a b c d Rezachevici 1991, p. 253. ^ a b c d Treptow 2000, p. 46. ^ Treptow 2000, pp. 39, 46. ^ a b Florescu & McNally 1989, p. 36. ^ Treptow 2000, p. 58 (note 69). ^ a b c d Cazacu 1991, p. 55. ^ Engel 2001, p. 237. ^ Treptow 2000, p. 43. ^ Florescu & McNally 1989, pp. 53–54. ^ a b Treptow 2000, p. 47. ^ a b Florescu & McNally 1989, p. 54. ^ Cazacu 1991, p. 53. ^ Rezachevici 1991, p. 254. ^ a b Cazacu 1991, p. 54. ^ Florescu & McNally 1989, pp. 54, 60. ^ Engel 2001, p. 288. ^ a b c d Treptow 2000, p. 53. ^ a b Treptow 2000, p. 55. ^ a b c Cazacu 1991, p. 56. ^ a b c Cazacu 1991, p. 57. ^ Engel 2001, p. 291. ^ a b Treptow 2000, p. 56. ^ a b c Cazacu 1991, p. 58. ^ a b Treptow 2000, p. 58. ^ a b c Treptow 2000, p. 59. ^ Mureșanu 2001, p. 176. ^ Florescu & McNally 1989, p. 67. ^ a b Treptow 2000, p. 60. ^ a b Treptow 2000, p. 61. ^ a b c d e f Rezachevici 1991, p. 255. ^ a b Treptow 2000, p. 62. ^ Treptow 2000, p. 77. ^ a b Treptow 2000, p. 74. ^ Treptow 2000, pp. 74–77. ^ Treptow 2000, pp. 78–79. ^ a b Treptow 2000, p. 95. ^ Engel 2001, p. 296. ^ Treptow 2000, pp. 95–96. ^ a b Stoicescu 1991, p. 84. ^ Treptow 2000, p. 98. ^ a b Engel 2001, p. 297. ^ Treptow 2000, pp. 98–99. ^ Rezachevici 1991, p. 256. ^ a b c Treptow 2000, p. 100. ^ Stoicescu 1991, p. 85. ^ Treptow 2000, p. 101. ^ a b Stoicescu 1991, p. 86. ^ Treptow 2000, pp. 100–101. ^ Engel 2001, p. 298. ^ Treptow 2000, pp. 101–102. ^ a b Stoicescu 1991, p. 87. ^ Treptow 2000, p. 102. ^ Stoicescu 1991, p. 81. ^ Treptow 2000, p. 82. ^ Treptow 2000, pp. 82, 103. ^ Treptow 2000, pp. 103–104. ^ Treptow 2000, pp. 106, 109. ^ Treptow 2000, pp. 108–110. ^ Treptow 2000, p. 108. ^ a b Treptow 2000, p. 104. ^ Florescu & McNally 1989, p. 116. ^ a b c d Stoicescu 1991, p. 88. ^ Stoicescu 1991, p. 93. ^ Treptow 2000, p. 112. ^ a b Stoicescu 1991, p. 94. ^ Stoicescu 1991, pp. 94–95. ^ Rezachevici 1991, p. 257. ^ a b Treptow 2000, p. 118. ^ Treptow 2000, pp. 118–119. ^ Treptow 2000, p. 119. ^ a b Rezachevici 1991, p. 258. ^ a b Babinger 1978, pp. 203–204. ^ a b Treptow 2000, p. 123. ^ a b c d Florescu & McNally 1989, p. 133. ^ a b Babinger 1978, p. 204. ^ a b c d Treptow 2000, p. 124. ^ Laonikos Chalkokondyles: The Histories (Book 9, chapter 90), p. 377. ^ a b c Babinger 1978, p. 205. ^ a b c Florescu & McNally 1989, p. 139. ^ a b Treptow 2000, p. 126. ^ a b c d Rezachevici 1991, p. 259. ^ Treptow 2000, pp. 130–132. ^ a b c Treptow 2000, p. 132. ^ Laonikos Chalkokondyles: The Histories (Book 9, chapter 101), p. 387. ^ Treptow 2000, p. 134. ^ Treptow 2000, p. 147. ^ Laonikos Chalkokondyles: The Histories (Book 9, chapter 104), p. 393. ^ a b Treptow 2000, p. 143. ^ Babinger 1978, pp. 205–206. ^ Treptow 2000, p. 140. ^ Babinger 1978, p. 206. ^ a b Florescu & McNally 1989, p. 150. ^ a b c Florescu & McNally 1989, p. 152. ^ Rezachevici 1991, p. 260. ^ Treptow 2000, p. 151. ^ a b c d e Rezachevici 1991, p. 261. ^ a b Florescu & McNally 1989, p. 156. ^ a b c d Treptow 2000, p. 153. ^ Florescu & McNally 1989, pp. 157–158. ^ a b c d Florescu & McNally 1989, p. 160. ^ Laonikos Chalkokondyles: The Histories (Book 10, chapter 1), p. 401. ^ a b Treptow 2000, p. 156. ^ a b Treptow 2000, p. 158. ^ a b Hasan 2013, p. 154. ^ a b c Treptow 2000, p. 161. ^ Andreescu 1991, p. 141. ^ a b c Hasan 2013, p. 155. ^ Hasan 2013, pp. 155–156. ^ a b c d e Hasan 2013, p. 156. ^ Rezachevici 1991, p. 262. ^ Treptow 2000, p. 162. ^ a b Andreescu 1991, p. 145. ^ a b c d Andreescu 1991, p. 146. ^ Treptow 2000, p. 164. ^ a b Andreescu 1991, p. 147. ^ a b Treptow 2000, p. 166. ^ Andreescu 1991, pp. 147, 151. ^ Rezachevici 1991, p. 263. ^ a b c Rezachevici 2001. ^ Florescu & McNally 1989, p. 179. ^ Hasan 2013, pp. 135–149. ^ Florescu 1991, p. 250. ^ a b c Hasan 2013, p. 151. ^ Florescu 1991, p. 251. ^ a b Kubinyi 2008, p. 204. ^ Hasan 2013, p. 152. ^ a b c d Hasan 2013, p. 159. ^ Florescu 1991, p. 252. ^ Florescu 1991, p. 192. ^ Florescu & McNally 1989, p. 195. ^ Treptow 2000, p. 157. ^ a b c Balotă 1991, p. 156. ^ a b c d e McNally 1991, p. 200. ^ Dickens, David B.; Miller, Elizabeth (2003). Michel Beheim, German Meistergesang, and Dracula. Journal of Dracula Studies, Number 5. ^ Kubinyi 2008, p. 85. ^ a b Andreescu 1991, p. 140. ^ Florescu & McNally 1989, p. 163. ^ a b Balotă 1991, p. 155. ^ a b Treptow 2000, p. 218. ^ Treptow 2000, p. 224. ^ a b Balotă 1991, p. 154. ^ a b Florescu & McNally 1989, p. 196. ^ a b Panaitescu 1991, p. 186. ^ David "Race" Bannon, “Dracula’s Art of War: A Martial Portrait of Vlad III Tepes,” Kungfu, Nov 2000: 18-19, 58-59. ^ Panaitescu 1991, p. 187. ^ a b Florescu & McNally 1989, p. 203. ^ a b c McNally 1991, p. 203. ^ Balotă 1991, p. 153. ^ Balotă 1991, pp. 153, 160–161. ^ Balotă 1991, p. 160. ^ McNally 1991, p. 209. ^ Balotă 1991, p. 167. ^ McNally 1991, p. 204. ^ Balotă 1991, pp. 155, 167. ^ Balotă 1991, p. 207. ^ Perrie, Maureen (1987). The image of Ivan the Terrible in Russian folklore. Cambridge University Press. ISBN 978-0-521-33075-6. ^ a b c Balotă 1991, p. 158. ^ a b Florescu & McNally 1989, p. 215. ^ Balotă 1991, p. 159. ^ McNally 1991, p. 218. ^ McNally 1991, p. 217. ^ McNally 1991, pp. 217–218. ^ McNally 1991, pp. 219–220. ^ McNally 1991, p. 219. ^ a b Florescu & McNally 1989, p. 216. ^ Florescu & McNally 1989, p. 217. ^ a b Florescu & McNally 1989, p. 218. ^ a b c Boia 1997, p. 200. ^ a b c Florescu & McNally 1989, p. 219. ^ Boia 1997, p. 195. ^ Boia 1997, p. 192. ^ a b Boia 1997, p. 196. ^ Boia 1997, p. 199. ^ Boia 1997, p. 17. ^ Treptow 2000, p. 176. ^ Florescu & McNally 1989, p. 221. ^ Florescu & McNally 1989, p. 225. ^ Florescu & McNally 1989, pp. 229–230. ^ a b c Cain 2006, p. 182. ^ Miller 2005, p. 112. ^ Florescu & McNally 1989, p. 231. ^ Florescu & McNally 1989, p. 230. ^ Florescu & McNally 1989, pp. 85, 161. ^ a b c d Florescu & McNally 1989, p. 84. ^ a b c Florescu & McNally 1989, p. 204. ^ Florescu & McNally 1989, p. 85. Thomas M. Bohn, Adrian Gheorghe, Albert Weber (Hrsg. ): Corpus Draculianum. Dokumente und Chroniken zum walachischen Fürsten Vlad dem Pfähler 1448–1650. Band 3: Die Überlieferung aus dem Osmanischen Reich. Postbyzantinische und osmanische Autoren. Harrassowitz, Wiesbaden 2013, ISBN 978-3-447-06989-2. Laonikos Chalkokondyles: The Histories, Volume II, Books 6–10 (Translated by Anthony Kaldellis) (2014). Harvard University Press. ISBN 978-0-674-59919-2. Cazacu, Matei (2017). Reinert, Stephen W. (ed.). Dracula. East Central and Eastern Europe in the Middle Ages, 450-1450. 46. Translated by Brinton, Alice; Healey, Catherine; Mordarski, Nicole; Reinert, Stephen W. Leiden: Brill Publishers. doi:10.1163/9789004349216. ISBN 978-90-04-34921-6. Andreescu, Ștefan (1991). "Military actions of Vlad Țepeș in South-Eastern Europe in 1476". In Treptow, Kurt W. (ed.). Dracula: Essays on the Life and Times of Vlad Țepeș. East European Monographs, Distributed by Columbia University Press. pp. 135–151. ISBN 978-0-88033-220-0. Babinger, Franz (1978). Mehmed the Conqueror and His Time. Princeton University Press. ISBN 978-0-691-09900-2. Boia, Lucian (1997). History and Myth in Romanian Consciousness. Central European University Press. ISBN 978-963-9116-97-9. Balotă, Anton (1991). "An analysis of the Dracula tales". In Treptow, Kurt W. (ed.). Dracula: Essays on the Life and Times of Vlad Țepeș. East European Monographs, Distributed by Columbia University Press. pp. 153–184. ISBN 978-0-88033-220-0. Cain, Jimmie E. (2006). Bram Stoker and Russophobia: Evidence of the British Fear of Russia in Dracula and The Lady of the Shroud. McFarland & Company, Inc., Publishers. ISBN 978-0-7864-2407-8. Cazacu, Matei (1991). "The reign of Dracula in 1448". In Treptow, Kurt W. (ed.). Dracula: Essays on the Life and Times of Vlad Țepeș. East European Monographs, Distributed by Columbia University Press. pp. 53–61. ISBN 978-0-88033-220-0. Florescu, Radu R.; McNally, Raymond T. (1989). Dracula, Prince of Many Faces: His Life and his Times. Back Bay Books. ISBN 978-0-316-28656-5. Florescu, Radu R. (1991). "A genealogy of the family of Vlad Țepeș". In Treptow, Kurt W. (ed.). Dracula: Essays on the Life and Times of Vlad Țepeș. East European Monographs, Distributed by Columbia University Press. pp. 249–252. ISBN 978-0-88033-220-0. Hasan, Mihai Florin (2013). "Aspecte ale relaţiilor matrimoniale munteano-maghiare din secolele XIV-XV [Aspects of the Hungarian-Wallachian matrimonial relations of the fourteenth and fifteenth centuries]". Revista Bistriţei (in Romanian). XXVII: 128–159. ISSN 1222-5096. Retrieved 13 September 2016. McNally, Raymond T. (1991). "Vlad Țepeș in Romanian folklore". In Treptow, Kurt W. (ed.). Dracula: Essays on the Life and Times of Vlad Țepeș. East European Monographs, Distributed by Columbia University Press. pp. 197–228. ISBN 978-0-88033-220-0. Miller, Elizabeth (2005). A Dracula Handbook. Education. ISBN 978-1-4134-8095-5. Mureșanu, Camil (2001). John Hunyadi: Defender of Christendom. The Center for Romanian Studies. ISBN 978-973-9432-18-4. Nandriș, Grigore (1991). "A philological analysis of Dracula and Romanian place-names and masculine personal names in.a/ea". In Treptow, Kurt W. (ed.). Dracula: Essays on the Life and Times of Vlad Țepeș. East European Monographs, Distributed by Columbia University Press. pp. 229–237. ISBN 978-0-88033-220-0. Panaitescu, P. P. (1991). "The German stories about Vlad Țepeș". In Treptow, Kurt W. (ed.). Dracula: Essays on the Life and Times of Vlad Țepeș. East European Monographs, Distributed by Columbia University Press. pp. 185–196. ISBN 978-0-88033-220-0. Rezachevici, Constantin (1991). "Vlad Țepeș – Chronology and historical bibliography". In Treptow, Kurt W. (ed.). Dracula: Essays on the Life and Times of Vlad Țepeș. East European Monographs, Distributed by Columbia University Press. pp. 253–294. ISBN 978-0-88033-220-0. Rezachevici, Constantin (2001). "The tomb of Vlad Tepes: The most probable hypothesis" (PDF). Journal of Dracula Studies. 4. Stoicescu, Nicolae (1991). "Vlad Țepeș' relations with Transylvania and Hungary". In Treptow, Kurt W. (ed.). Dracula: Essays on the Life and Times of Vlad Țepeș. East European Monographs, Distributed by Columbia University Press. pp. 81–101. ISBN 978-0-88033-220-0. Treptow, Kurt W. (2000). Vlad III Dracula: The Life and Times of the Historical Dracula. The Center of Romanian Studies. ISBN 978-973-98392-2-8. Trow, M. J. (2003). Vlad the Impaler: In Search of the Real Dracula. The History Press. ISBN 978-1-910670-08-8. Marek, Miroslav. "A genealogy of the Drăculești family". genealogy.euweb.cz. Miller, Elizabeth (2005). "Vlad The Impaler". Vlad the Impaler. n.p. Retrieved 16 February 2015. Anset, Kat (23 November 2011). "Vlad the Impaler". The Good, the Bad, and the Monstrous. n.p. Retrieved 16 February 2015. Lallanilla, Marc (24 October 2014). "The Real Dracula: Vlad the Impaler". LiveScience. Purch. Retrieved 26 July 2016.